Our QQI Managing People course is intensive and thorough, equipping your team with everything they need to successfully manage others. Course content includes key management skills such as developing strong team relationships, creating a productive culture within your team, enhancing communication skills, and understanding relevant legislation. Choosing our in-company training format enables us to focus on your team’s needs and goals. We will deliver training to your team at a venue chosen by you, and on dates that suit your business calendar. 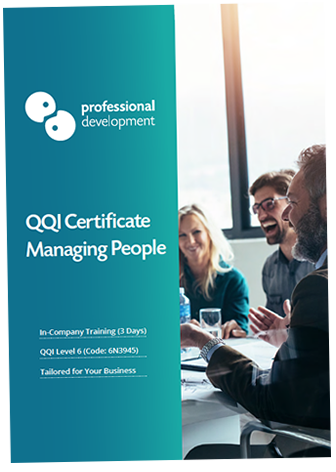 What are the benefits of delivering this QQI Managing People Course as an in-company programme? This workshop is designed to empower your management team, providing them with a practical, relevant guide to managing others. Completing the training and its accompanying assessments will enhance their confidence within their role. When your management team have completed this workshop together, they will have a common skill-set and understanding of important workplace legislation. This helps to create a unified approach to performance management, teamwork and motivation, and level of communication. Once participants have successfully completed training and the accompanying assessment work, they will gain a QQI Level 6 certification in Managing People. Choosing in-company training gives you the freedom to deliver the programme to your team on dates that work best for your business. It minimises disruption to your team’s productivity. If you have a number of candidates for management training, our in-company price model often works out as substantially more cost-effective than sending each candidate on a public course. What is covered during this QQI Managing People Course? What is the assessment and certification process? Participants must begin by attending the QQI Managing People programme. Following training, there is a period of self-directed learning which includes completion of the required assessment work. We provide each participant with a detailed assessment brief and relevant course materials. Assessment work must be submitted 8 weeks after the last training date. It will then be graded, and if successful, submitted to QQI for certification. Those who have achieved the certification will receive their physical QQI certificate approximately 5 - 6 months after they submit their assessment work. You can read more about this course by downloading our brochure, or click below to ask us a quick question. Is this course designed for experienced or new managers? This is a programme that works well for all levels of management experience. New managers absorb the course as a practical, informative guide to management. Those who have been in management roles for some time find the programme beneficial as a ‘refresher’ and a source of new ideas. I’m not looking for in-company training. 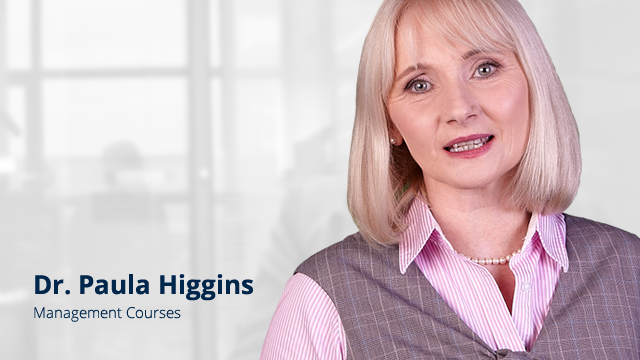 Are there any public course dates available for QQI Managing People? Yes, we offer this course for public attendance throughout the year in Dublin. You can click here to learn more about our public course, and request dates. There are a maximum of 14 places available for each date. Due to QQI Managing People’s popularity, we recommend booking as far as possible in advance. How can I find out more about running QQI Managing People in my company? Here are 3 easy ways to get started. You can call us on Freephone 1800 910 810. Our training consultants will chat with you about the best route for your training needs. Alternatively, click below to ask us a question, or above to request an in-company quote.